Ok, I know I post an awful lot of spider photos. I have a couple good excuses. First, I like spiders. I just do. Second, for whatever reason, my eyes seem to find spiders as I walk through prairies. Third, spiders are abundant in prairies (and most other ecosystems) and they play very important roles in prairie ecology. It seems appropriate for them to be well represented in any collection of grassland images. This tiny spider made its web on the flowering head of switchgrass in the Nebraska Sandhills. Valentine National Wildlife Refuge, Nebraska. But mostly, I just like spiders. I hope you do too. 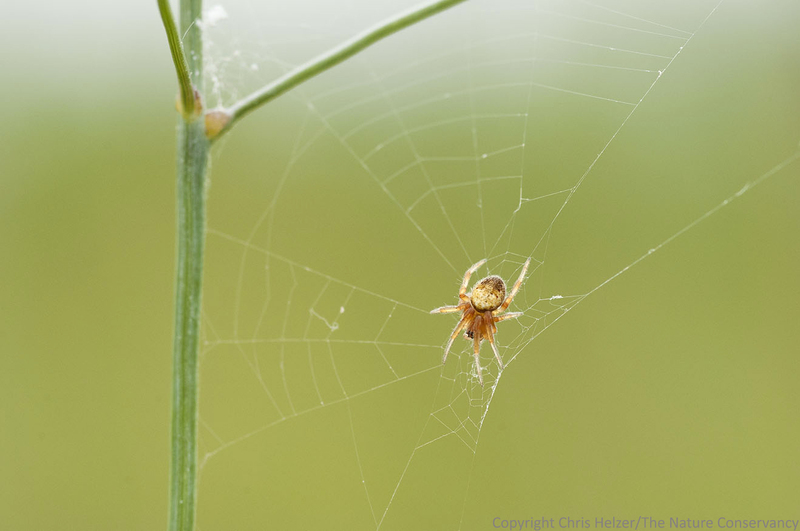 This entry was posted in Prairie Insects, Prairie Natural History, Prairie Photography and tagged grassland, nebraska, prairie, sandhills, spider, switchgrass, web by Chris Helzer. Bookmark the permalink. I Used to absolutely hate spiders, despite knowing their ecological importance and value. Through your imagery and over this blog I have found them to be much more interesting, dynamic, and slightly less grotesque then before. Thanks for all the great work, I really enjoy getting to spend even a couple minutes out in your praires through your lens and words. Thanks Tony – that’s great to hear! A musical tribute to this great photo. I like them too Chris . . . and usually ‘collect’ a few big Argiopes on my tractor (and on me) when I am out doing fire break maintenance. That looks like a small Araneus on the switchgrass. As you well know, it is the little things that are the real movers and shakers out there, especially in the BIG part of the prairie that is underground!! Great pics as always – and keep up the great work!! I miss your long landscape shots and commentary. The grand element of the prairie is an important component of its beauty: the microcosmic and the macrocosmic as well. Fall colors on the grasslands and in the wooded drainages, the sumac and bluestem…makes my heart ache. Beautiful and fascinating! What’s not to love. When I was little, my mother did her best to make me afraid of spiders. She was very successful until one day I was “helping” my father paint on the outside of the house. He would move the daddy long-legs out of the way before moving from one area to another. When I asked him why he didn’t kill them he explained to me how beneficial they are and that daddy long-legs were his favorite spider. I figured that if daddy had a favorite spider that they couldn’t be as bad as mom made them out to be. Much to my mothers dismay I became quite fascinated by them. This last week I have been painting on my own house and I spend more time moving the little ones that like to hide in the nooks and crannies than I do actual painting. It is good to know that I am not the only one who loves the spiders. I too like spiders. Keep posting!